Note: All ratings are for the Unrated Version. Plot Synopsis: When Dan Cain (BRUCE ABBOTT) advertises for a roommate, he finds one in the form of Herbert West (JEFFREY COMBS). Initially a little eccentric, it soon becomes clear that West entertains some seriously outlandish theories – specifically, the possibility of re-animating the dead using a serum of his creation. It’s not long before Dan finds himself under West’s influence, much to his dismay and displeasure of his girlfriend (BARBARA CRAMPTON), and embroiled in a serious of ghoulish experiments which threaten to go wildly out of control. 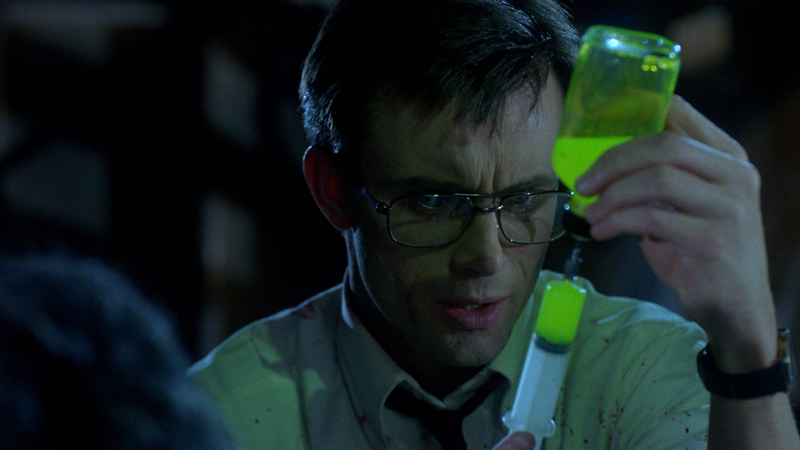 Quick Hit Review: For whatever reason I had never seen Re-Animator despite knowing full well of its existence and the cult status it has maintained for decades. So, going in my I checked my expectations as I’ve found these kind of cult films disappointing, but I’m happy to say… this was a fantastic horror-(dark) comedy! I dug the film from the first minute to the finale. Not only are the make-up/gore effects well done, not only for mid-80s but even by today’s low budget standards, but the story actually isn’t half bad and characters developed well enough for the short running time and, for two of them, rather despicable human beings. Mind you, the Integral Version isn’t bad, I just found the pacing to be off and those additional scenes didn’t necessarily develop the characters that much more and giving Dr. Hill mind control abilities seemed a bit weird even by this movie’s standards. This two-disc set comes housed in a fold-out digi-pack tucked inside a hard outer-box. Also inside this box is the 1991 comic book adaptation of the movie. Inside the digi-pack are post cards with scenes from the movie as well as a booklet with essays and information on the transfer. Re-Animator: Resurrectus (1:08:36; SD) – This is a lengthy retrospective documentary made back in 2007 and includes sound-bites with members of the cast (Jeffrey Combs, Bruce Abbott, Barbara Crampton) and crew (Stuart Gordon) as they recollect on their time working on the project and the impact it has had. Music Discussion with Composer Richard Band (16:31; HD) is an extended interview with Band guiding viewers through some of the score. Barbara Crampton in Conversation (36:05; HD) – Conducted in 2015 at the FrightFest festival in London, journalist Alan Jones interviews the actress as she looks back on her career. Multi-Angle Storyboards offers a look at three scenes where you can toggle between the scene and original storyboard drawings. Last up is the Trailer (1:57; HD), some TV Spots (2:36; HD) and a Still Gallery (HD). A Guide to Lovecraftian Cinema (54:02; HD) – Chris Lackey, host of the H.P. Lovecraft Literary Podcast, provides a comprehensive look at the many cinematic incarnations of Lovecraft’s work. 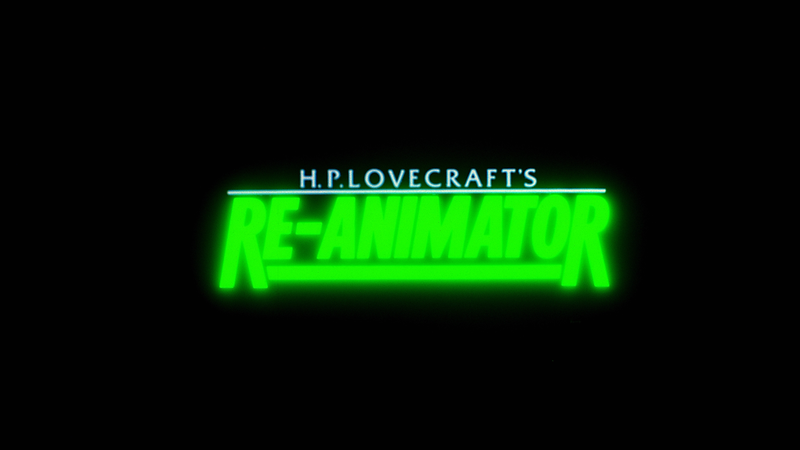 Doug Bradley’s Spinchillers: Herbert West—Reanimator (1:38:32; HD) is a reading of Lovecraft’s original classic story by actor Jeffrey Combs. Arrow Video releases Re-Animator onto Blu-ray presented with a 1.78 widescreen aspect ratio and sporting a new 1080p high-definition transfer culled from a 4K restoration in which numerous instances of dust marks, specs and film damage was repaired. This is a great looking picture with some brilliant colors (like the green in the serum and, in one scene, Dan’s red sweater) and detail appears sharp and well defined. Now, it’s not perfect. In spite of getting cleaned up, I did notice a few minor dust marks and vertical lines in a variety of scenes. However, unless you’re looking real close, it’s not terribly perceptible. The Unrated Version comes with a trio of options: 1.0 and 2.0 PCM and 5.1 DTS-HD Master Audio, the latter presumably carried over from the 2012 Blu-ray release. I decided to watch the entire film with the default 1.0 track with some testing on the other two. With the mono track, I found it to sounded incredible providing both crisp, clear and clean dialogue levels to go along with the blood-curdling screams, especially during the finale, as well as Richard Band’s score pushes through and excellent clarity. 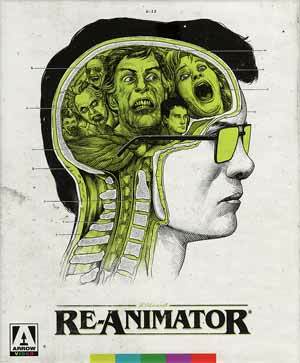 Overall, Re-Animator is a fun horror-comedy from the mid-80s, with enough blood to satisfy gore-hounds, and receives a nice upgrade over its 2012 Blu-ray stocked full of wonderful extras, a few new to this release from Arrow Video, and offering up excellent video and audio transfers.